Black Zone Myth Chant is a project of Afrocentric psychedelia and hypnotic footwork by psych-drone artist High Wolf. Sometimes described as “Sun Ra meets Dj Screw”, various Black Zone Myth Chant releases have been released on Low Jack’s label Editions Gravats, including Mane Thecel Phares (ranked 33 in the 2015 albums of the year Boomkat’s charts). The story of the project starts in 2011. Back from the US where he spent some time touring, hanging out with friends and listening to DJ Screw, High Wolf sat down in his studio and, without any plan, recorded Straight Cassette within a couple of days. 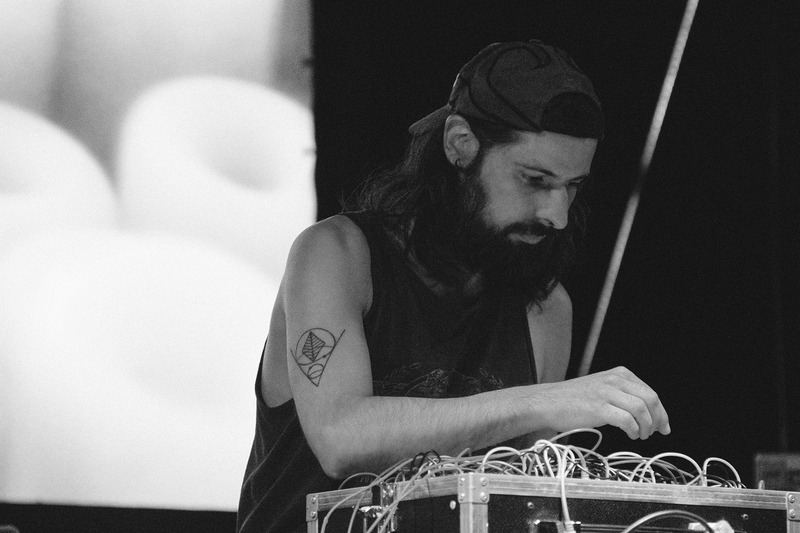 Black Zone Myth Chant was one of the SHAPE artists performing at Novas Frequencias’ SHAPE showcase in Rio de Janeiro last year, where this interview took place. Does the context influence what you play? Right now, I’m in a phase where I try to not to really care about the context, as long as it’s pretty standard and not a seated audience at 2pm in a gallery, for instance. It’s more about the live show being a predetermined thing, with freedom of interpretation based on what’s going around and what my intuition tells me. Is there a difference between Black Zone Myth Chant and High Wolf in this respect? The live show approach is similar. I’m going to feel the same during the show, trying to understand what’s happening and feel the vibe. For instance last night, I thought I would go in some direction and then at the end it got a bit more energetic, and I decided to finish with that. It’s about reading the room. But I’m not going to sell out and do what people want me to. Is the psychedelic, immersive aspect important to your work? It’s not something that I think about. It just happens. I stopped trying to explain it. People use that word to describe my music, and I’m totally fine with it, but it’s not something that I try to do. Black Zone Myth Chant is surrounded by mysticism. Can you talk about it? It’s more a big blur of many different things. Maybe it’s good it stays mysterious. I remember when it first appeared – with the whole imagery. I was wondering who could that be. When I think about projects – it can be a new band or a record, there’s a conceptual way behind it, once again it’s as much intuitive as thought of. It has to go beyond the music, there has to be a story behind it, a reason why it exists, and it has to show something different than what I’ve already done. Has Afrofuturism been an influence? It’s definitely a big influence. Maybe more on the second album. It’s mythological and it’s artistic. I like that it’s about the whole world, not about a specific music style. It was about the way people dressed, about every aspect of their life. I like this living in an imaginary world on top of an existing one. You decide to see things through some kind of filter. That’s what I do in life. What are the mythologies of today? I have nothing against science, on the contrary, but it kind of killed the poetic approach to life and within it, mythology. I’ve heard a very interesting comment that despite the fact that science killed mythology, science gave the most eccentric mythology / cosmology – we are all stardust. Mythology was the first science, people trying to give answers to questions that have no answer. Now that we get some of the answers, we feel that we don’t need this kind of view of the world, the answers we get are equally beautiful, powerful and poetic as imaginary tales or mythologies from the past. We just lost that way of looking at things. Can you talk about High Wolf and how you got connected to the US psychedelic, Not Not Fun scene? I think it was a big shift in the way people made music. Not in terms of style, but interaction. When I started High Wolf, it was the beginning of Myspace. If I had started this ten years earlier, I would have stayed in the local scene. I’d been making this music more or less in musical isolation, and then I found out that people had been doing the same in the US, mainly the Not Not Fun guys. So I found my local scene over there. We just got in touch online, and decided to collaborate. That’s how I played my first shows and put together my first record. After that, a lot of people have started to associate me with those guys and think I’m from the US. So the internet has had a big impact on your work? Yes, big time. I don’t even think I would make music without the internet. If it wasn’t for the internet, I would have done my thing, which in the beginning was way more obscure and niche than now. I would probably have played a few shows in my city, and nobody would have cared. Maybe I would have stopped and done something else. I found support and audience spread out over different parts of the world because of the internet. It was a sign that it was not such a bad idea to try to make music. But the music scene has really changed. We’ve gone from people getting together and working as bands to everyone making music by themselves – solo projects on Ableton. It’s the same with touring. You had to have a promoter or tour agent for each country, working by phone or letters, and now you have a million ways to contact people. You can do things yourself. It’s a total game changer. Do you see any negative sides to it as well? Not really because anyone can have a shot at it, you can show your art to the world. I guess there is what I would call a natural selection, which is not always 100% rational, some people will make it, some people won’t. It’s a fair game, but there is also a lot of wrong reasons why some people are making it in this business, let’s not be naive. There’s too much music out there than we can handle anyway so it’ll be selected somehow. Have you noticed any differences in perception between your Black Zone Myth Chant and High Wolf material? Black Zone Myth Chant started a little later and it was inactive for a few years. I got back to it a few years ago partly because of a friend / label manager / DJ from the techno scene who encouraged me to make a new album. It’s good for me because now I can play under different names, express different ideas and reach different audiences. But it has a side effect: I’m sometimes too preoccupied on keeping a clear line between those projects and it certainly goes against creativity at some point. What about the vocals on Black Zone Myth Chant, how important are they? It’s a way of using vocals – kind of in-between chanting, talking and not talking, that deep down is like trying to talk to the subconscious. I think it’s very important that we don’t understand what it’s about. It has this ritualistic, mysterious way of communicating beyond words. I feel that, probably for some biological reason, the human voice has a bigger impact on your brain than any other sound. There’s probably something in our brain that tells us to pay attention to what a fellow human being is talking to us. So a certain degree of mystery is important to you? Yes. And the subconscious. There’s a lot of it in this project. Right now, we are talking to each other, but we do a million of gestures that we are not aware of. We feel like we are in control of our life, what we talk about and do, but we just aren’t. It’s about exploring the different levels of consciousness that are somehow part of me. Intuitively, I feel it, because I’m dreaming and in my dreams I have a view of what it’s like, like everyone. When you pay attention to your subconscious every day, you start to understand it a little bit. It’s a fascinating subject and I think Black Zone has a lot to do with that matter. You have been using a modular synth in your music for a while now. When you get familiar with this kind of equipment, it’s the ultimate control-giving instrument (which is a funny thing to say for someone who just said we don’t control much). You design your instrument; the modules you chose and the way you use or patch them is all up to you. Your synth becomes your world. It’s a very romantic instrument in a way. Creatively speaking, it opens up a billion doors all of a sudden, maybe even too many at once, so it can be confusing. I’ve been using it for a few years, but I feel I’ve only just scratched the surface. I stopped using it when I got my modular synth because I got bored of it. I was getting to a point where my technique was hitting a wall and it became a routine. And in terms of texture, guitar will always sound more or less like guitar, at least in my hands. I sometimes miss playing the instrument, the feeling of it, but I’m not interested in it right now. Do you think you would be making music if you stayed in the local scene? I don’t think so to be honest. I’ve always been intro travelling – it’s a way of life, and touring, showing my music to different people in different places, is a huge factor in my motivation for creation. A lot of my friends started making music around the same time as me but were not really into the touring aspect, so they have a very different life now. My experience is that if I’m here now, it’s also because I tried and decided that I wanted to do that, not doing records only but playing live shows as well. I think if I was stuck at home playing random shows in bars, I would be frustrated, but you can never tell. Probably it has a lot to do with the ego too. I guess I’d be more enlightened if I was able to do that: playing in a local bar amid general inattention and still be happy about it. Any of us can go from bigger to smaller and vice versa very quickly, and that’s when you need to be at peace with your ego so you don’t become eager or angry. Do you have any other creative outlets apart from music? Music is the most important thing, but I also write. When you really focus your life on something – like music in my case – you spend almost every day doing it, but sometimes you get a little anxious thinking about what is going to happen if you don’t want to do it anymore. What could fill that hole? The day it happens, I know I would be into trying to write a book or something similar. I would be very passionate about it. That is some kind of safety net. Sometimes I fantasise about stopping everything for a year and writing a book. The music takes place in the now. The music I played yesterday in Rio was new stuff, created in the past couple of weeks. The time between the creation and realisation in music is not so long. I want to go crazy doing a piece of art, which would consume me. For some reason, I’m able to make music and release it (with difficulties though, to finalise things and say “it’s finished now”), but maybe I would never be able to reach a point where I’m satisfied with my writing. I like automatic writing, random thoughts, mixing philosophical thoughts, psychological theories, diary style reflexions, studies about yourself. When I do it, it’s a constant flow – the mind is way faster than the hand. I like that instead of music it has no public diffusion, its purpose is not to be shared (at least in that form) so it gives me absolute freedom in content and shape, hence probably my most intimate outcome possible. Usually I feel the need to write when I experience something like this: we take something for granted, anything, like a concept, an animal, the wind, breathing, because we experience it every day, and then one day you look at it differently, you stop for a second and you’re like: why is that thing the way it is? For example, water is something we experience everyday, 99% percent of the time without thinking about it, and then one day you’re like: wait, where does it come from? How come those molecules make that whole, that substance? Why do I need to drink it so I don’t die? How come my body is mostly made of water? What does it mean to my individuality that I’m 2/3 made of water? All this is the beauty of life. It can be super boring if you look at it in a certain way. Or it can be overwhelming with beauty and poetry. And it’s a lot of questions without answers.